Wednesday morning I get to work and am feeling wonderful! The sun is shining, the skies are blue, I’ve got my little Roxy with me and everything is going well. I take one of the horses out for a lovely long ride and give myself lots of time for mindfulness while I ride (a new found favourite!) and come back feeling totally zenned 😀 After everything is done I set about cleaning some tack until it was home time, I heard a strange bang but thought nothing much of it, then it came again and I figured it must be the lorry on the yard so I merrily carried on. That’s when it all went wrong! !… I toddled out the tack room to head home and was met by my friends concerned expression, ‘I don’t want you to panic, everyone’s fine’ …. 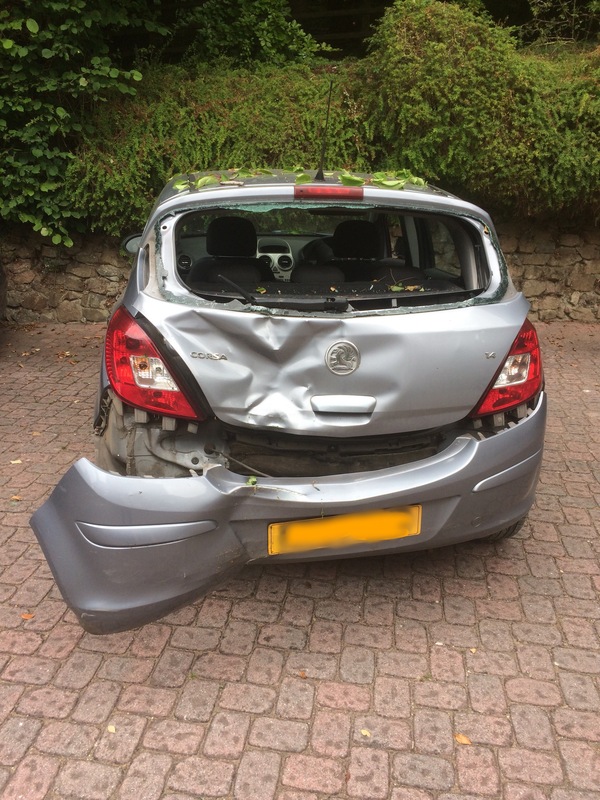 immediately I panic … ‘your car has just rolled down the hill and crashed itself into a tree’. YOUUUU WHHHAATTTTT?!?! 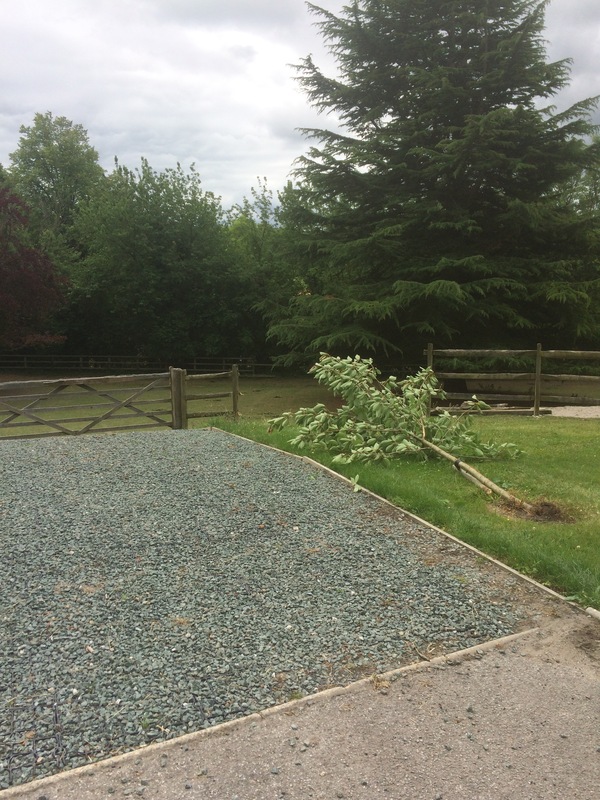 Not only that, it had gone through two sections of fencing, mown down an entire tree and showered a cyclist in windscreen glass as she cycled on by its final resting place. Now then, this is where I feel really proud of myself … old me would have thrown a complete wobbly, there would’ve been tears, shaking, the involuntary reaction to throw up, panic attack the whole caboodle. However, new me took a deep breath, assessed the situation and confirmed no one was hurt then trundled down the hill to my poor car. Not gonna lie it was a bit upsetting, to some it was just a Corsa but to me it was my little Ferrari haha! The back end was all caved in, the rear windscreen disintegrated, my cookbook was in the hedge, all in all a rather sad moment but like the trusty little motor he was he roared into life and cruised straight out the wreckage so we could assess the damage. It didn’t take long to conclude that was the end of my Corsas life 😦 So a gazillion phone calls later … and a few days on …. the car is awaiting a lift to the scrap heap in the sky, Vauxhall are investigating to find the cause of the handbrake failure, I am going insane trying to find the perfect replacement for my little soldier and I’m feeling remarkably calm about the whole thing! Thursday morning brought me a letter from the Gynae clinic to tell me my appointment for organising cyst removal is being moved back a month ;-( I refuse to complain as we’re blessed with free health care, but while I feel like some little cretin is living above my appendix stabbing me every single second of every hour I may possibly have felt a little deflated at the prospect of having to wait even longer for the damn thing to get removed!! Annoying but not worth getting upset over (another hurdle in the positive mindset obstacle course called life! ).